Abstract: Parallel port is the most popular choice for interfacing. The 8 data output lines and sometimes the CONTROL and STATUS ports of the parallel port, used to feed data into the computer, are not sufficient for some complex projects. Some projects require more data I/O lines. 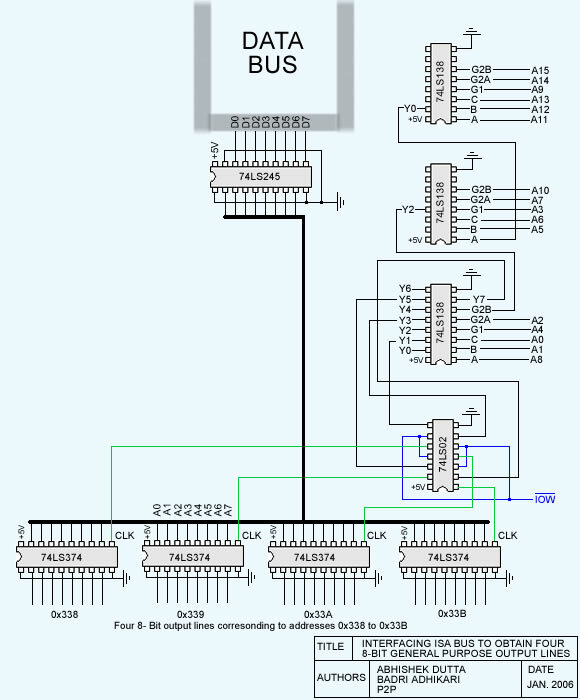 This project shows how to get 32 general purpose I/O lines by interfacing the ISA Bus. Though PCI bus can be a candidate for interfacing experiments, its greater speed and feature rich nature poses great complexity in terms of hardware and software to beginners. So this project can be a stepping stone to those thinking of ultimately getting to PCI Bus for interfacing experiments. This project can also be useful for those thinking of making Digital Oscilloscope using PC, A/D and D/A converters, Microcontroller programmer, etc. We have considered X(n) as the side that contains components in any standard ISA cards. Similarly, Y(n) is the side that contains the solder. It is very important for you to be clear of the above convention. You will damage your motherboard if you connect just the other way. They are the 8 data lines representing the 8-Bit data bus. 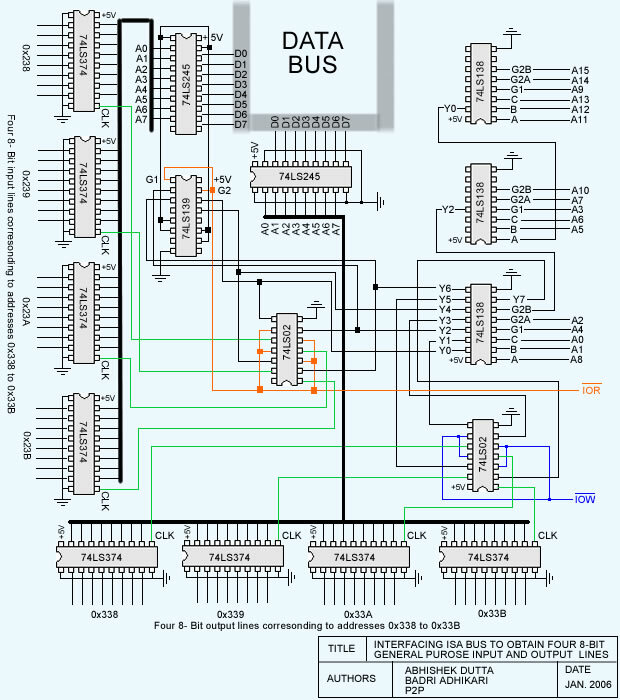 It is used by the DMA controller to take over to data and address bus during DMA transfer. They are connected to ground of computer. The microprocessor makes this line LOW while doing WRITE TO MEMORY. The microprocessor makes this line LOW while doing READ FROM MEMORY. The DMA controller signals on these lines to let devices know that that DMA has the control of buses. These pins allows the peripheral boards to request the use of the buses. The DMA controller sets this signal to let the peripheral know that the programmed number of bytes has been sent. Interrupt Signals. The peripheral devices set these signals to request the attention of the microprocessor. Address Latch Enable. This signal is used by the microprocessor to lock the 16 lower address bus in a latch during a memory or port input/output operation. It is a high frequency clock which can be used for the I/O boards. Before going into the details of full project lets explain the part that handles the four 8-Bit output lines only. The addresses in the range 0x338 to 0x33B was not used by any devices for input output operations in our computer. The three 74LS138 ICs handle the address decoding part. We have connected the address lines in a way such that there is short pulse (CLOCK) in the wires (represented by green wire) whenever the address lines contains the address in the range 0x338 to 0x33B and port output (IOW) is requested. Whenever the 74LS374 get a CLOCK PULSE it latches-in the 8-Bit data present in the data bus. 74LS245 is a 3-STATE Octal Bus Transreceiver. It reduces DC loading on the data bus and allows isolation of data bus when required. To know that I/O port address are available for use in this project we examine the contents of ioports in the /proc directoryof our linux system. It is clear from the above output that the addresses 0x238-0x23B and 0x338-0x33B are not being used by any device. Usually this is the case in most computers. However, if this address is occupied by some device, then you have to change the wiring of address lines to three 74LS138 IC (used for address decoding).We describe the address decoding technique here briefly so that you can setup unique address for I/O device we are trying to build according to the non-used address available in your computer. We observe that address lines A8A1A0 only change in case of all the eight addresses. The whole process of connecting wires to 74LS138 IC is like solving a puzzle. Connect the remaining wires ( A15A14A13A12A11A10A9A7A6A5A4A3A2) to two 74LS138 such that they finally give low output when these lines have the address bits that partially match our addresses (except A8A1A0 ).Now we connect the remaining lines (A8A1A0 A2) to the third 74LS138.All the 8 outputs of this IC is used to select the 74LS374 latches corresponding to input and output addresses after it is NORed with IOR and IOW using 74LS02 to distinguish between memory IO and port IO addressing. Now we are ready to describe the functioning of the complete circuit that will give us 32 general purpose I/O lines. The three 74LS138 IC are used for address decoding along with the two 74LS02(2 input NOR gate). Whenever a match is found in the address lines, the respective output line, Y(x) of the third 74LS138 IC (connected to the two 74LS02 IC), gets LOW. These lines along with IOW (and IOR) are connected to the NOR gates (74LS02), which gives HIGH only when the two inputs go LOW simultaneously. the IOW or IOR lines go LOW, representing the PORT IO operation. Remember,if we do not consider the second case, our device will conflict with the memory IO operations in the addresses 0x238-0x23B and 0x338-0x33B. We can see in the circuit diagram that the output lines of NOR gates are connected to the CLOCK pins of 74LS374 latch (represented by green wires).So whenever the above two cases match simultaneously, CLOCK pulse is sent to the respective latch and the data in the data bus is latched-in which appears in the output lines. 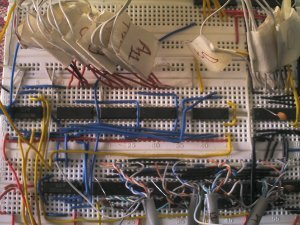 isa.c illustrates the some simple coding methods to control and test the I/O lines of the device created in this project. ioperm() gets the permission to access the specified ports from the kernel. outb() and inb() functions defined in sys/io.h helps us write and read to specified port. 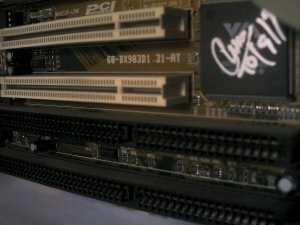 We are not responsible for any loss or damage caused by this article.The probability of frying up your motherboard is more than 100% if you work on this project without using your mind.Keep your eyes open and mind alert while doing the wiring and connecting the ICs and verify all the VCC and GND connection everytime you switch on your computer after connecting this device to ISA slot.YOU HAVE BEEN WARNED :). Fortunately the motherboard used for this experiment is still alive and the experiment was a huge success. When I said ‘data bus’ I meant line A0 – A7 (the thick black line) that connect all the 374’s used for input to the 245.Note that I mean the lines A0 – A7 in the highlighted area only.The 374’s and 245 I refer to are only the ones that are either partially or completely inside the red box I have drawn. The OC’ line (pin 1) on each 374 is connected to ground, which enables the outputs of each 374 all the time and it also keeps it’s outputs in the state that they were when the last clock pulse was recieved, even when the clock line is LOW because this is how the 374 works according to the datasheet.With every 374’s output enabled, any bits that are HIGH on any 374 connected to A0 – A7 would be grounded or interfered with by the 3 other 374’s that are connected to A0 – A7 too. If A0 on the 374 at address 0x238 was set HIGH and the 3 other 374’s (0x239, 0x23A, 0x23B) that are connected to it through A0 had their outputs set LOW, they would make A0 go LOW. This is because each 374 that has an output that is LOW is actually connecting the output to ground through it’s internal circuits. The way to resolve this problem is to use the OC’ line to enable the 374’s output onto A0 – A7 only when it is needed. As you probably already know, if we make the OC’ line (pin 1) of a 374 HIGH, it’s outputs will go into a high impedance state which would basically have the effect of disconnecting the outputs of the 374 from lines A0 – A7. TLM replied: Yes, you are right. You can connect an inverter’s(whose input comes from the clock line) output to the OC’ pins of 374 latches to prevent the possible interference. I didn’t not know that LOW output of 374 IC lines are actually connected to ground through it’s internal circuits. I have learnt a new (and very important) thing about 374 ICs today. I will update my circuit to implement the idea suggested by you.